Accra Technical University (ATU) Women's Basketball Team's reign atop the Ghana Technical Universities / Polytechnics Sports Association (GHATUSA) Games has ended. Takoradi Technical University (TTU) ended ATU's reign earlier this morning at the latter's Court in Tudu thanks to a 21-19 win. In the first of two showdown games in the finals between the two institutions in the Male and Female Basketball Finals, TTU ended victors in the Women's Division after a closely contested matchup. 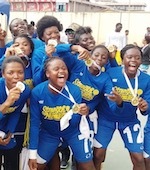 By winning gold in the division, Takoradi after several failed attempts escapes the dominant shadow of Accra Technical. Led by sharp shooter and Captain Magdalene Fiamekor, Takoradi had enough firepower to withstand ATU's threat throughout the matchup to the delight of Coach Owusu Ankrah. TTU qualified to the final thanks to a 24-10 win over Koforidua Technical University (KTU) while ATU got a walkover win over Kumasi Technical University (KsTU). KTU clinched Bronze thanks to a 23-7 win over KsTU in a matchup that took place on Thursday, February 7 at the same venue. Most Valuable Player Award winner of the 2019 Sprite Ball Championship Girls Division Abigail Gyamfi has stated her ambitions to play at the highest level. In an interview on Kumasi-based Angel FM's 'DS Sports' program, the soft spoken player revealed she has the grand ambition to play in the WNBA-Women's National Basketball Association. Gyamfi won the coveted MVP Award in the just ended Sprite Ball Championship that had Kumasi Girls Senior High School successfully defend its 2018 title. Kumasi Girls beat Mfantsiman Girls Senior High School 22-14 in the final game to end the campaign without suffering a loss. Gyamfi played a starring role in Kumasi Girls amazing run in the 2019 edition of Ghana's biggest high school basketball tournament. Responding to a question regarding her aims playing in the sport, she said, 'I pray I get the chance to play in the WNBA in a couple of years'. Gyamfi was a member of the 2018 winning group and on a again high note by winning the 2019 trophy. 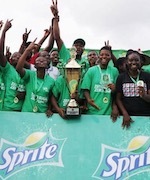 For the second time in two years, Kumasi Girls Senior High School has emerged victorious in the Girls Division of the Sprite Ball Championship. The 2019 edition of the celebrated Championship ended earlier today with Kumasi Girls retaining its title after beating Mfantsiman Girls Senior High School 22-14 in the final. Despite taking a huge 11-0 lead, Kumasi Girls were made to work for the win as Mfantsiman battled hard to trail 6-11 at the end of the first half. Another big run from the Saltpond based school panned out early in the second half but was snuffed out quickly by Kumasi Girls with Center Abigail Gyamfi leading the way. Gyamfi was named Most Valuable Player in the Division. Kumasi Girls won its first title last year on the back of a torturous journey from having no standard playing surface to practice on. The bumpy nature of the thread bare surface forces players to improve ball handling skills using the smoother surface in the school's Assembly Hall. Despite incessant calls for help, the playing unit had to endure another strenuous preparation on the poor surface for this year's competition.